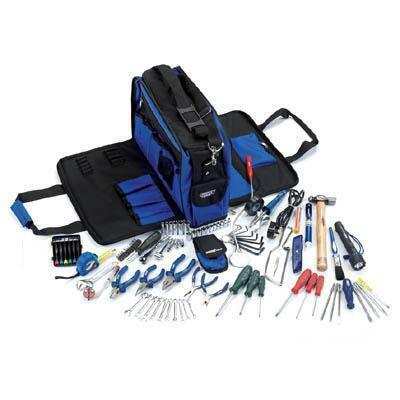 A range of top quality kits designed for the professional tradesperson. These toolkits have been designed to provide all the necessary tools for machinery, vehicle and plant maintenance or repair. Supplied in strong zip-up tool bags, lockable tool box, tool chest or case for easy carriage and tidy storage. A must for anyone tasked with keeping larger premises up and running. With a great selection of spanners, screwdrivers and pliers most jobs can be tackled. We've even included an inspection mirror and jewellery screwdrivers for those really fiddly tasks. Consists of: mobile phone pouch. Trimming knife. 6 piece jewellers screwdriver set. Adjustable wrench. Mains testing screwdriver. 230V 25W soldering iron. Solder wire. Desoldering sucker. Inspection mirror with flexible shaft. Measuring tape. Junior hacksaw. Rubber torch. 8 piece hexagonal key set. 10 piece metric combination spanner set. Insulation tape. Pain brush. Ball pein hammer. Side cutters. Pliers. Combination pliers. Long nose pliers. 3 x plain slot screwdrivers. 3 x PZ Type screwdrivers. 8 piece screwdriver set. 35 piece 1/4" sq. drive socket set. Tweezers.